Pep Guardiola has shrugged off Manchester City’s newly-restored status as title favourites. The champions are once again considered the side most likely to win the Premier League by bookmakers following Liverpool’s recent wobbles. Jurgen Klopp’s Reds, who have drawn their last two matches, remain three points clear at the top, but City can now overtake them with victory at Everton on Wednesday. 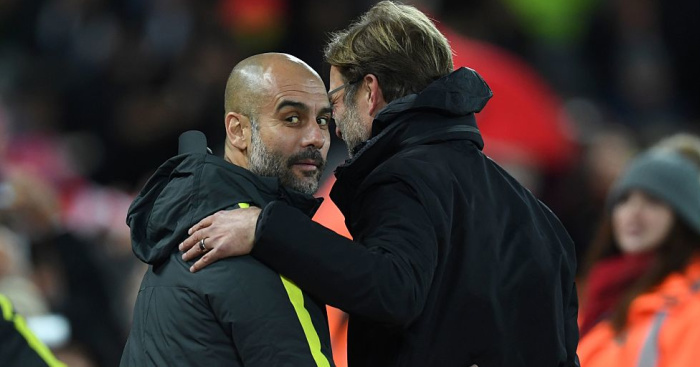 Guardiola said: “Three or four days ago we were already done – the champions were Liverpool. And now we are favourites! “Maybe in three days we will be leading – or we could be six points behind. “We try to be calm in this situation. There will be a lot of surprises and it will be tough for teams to win games. All the teams have the abilities and skills to create problems. “What I’m more concerned about is to never forget who we are as a team. When doing what we have to do we are a strong team. Guardiola does acknowledge his side’s rearranged game against Everton – brought forward because of City’s involvement in the Carabao Cup final – does present an opportunity, however. Victory would see City go top on goal difference, having played a game more than Liverpool. Guardiola endured one of the low points of his reign when City were thrashed 4-0 at Everton just over two years ago. He said: “It’s a long time since we lost there. I am not going to Goodison Park thinking about what happened in the first year. “In the second year we made an exceptional performance there before we played at Anfield in the Champions League. Everton boss Silva is under growing pressure after an indifferent run of form. The Toffees were booed off after their 3-1 loss to Wolves on Saturday, their eighth defeat in 14 games in all competitions, and the Portuguese manager is facing mounting criticism. Guardiola feels people have been too quick to get on Silva’s back in his first season at the club. He said: “People don’t know how difficult it is to create teams. People believe by buying three or four players with a new manager and everything is perfect immediately. It takes time.